What? 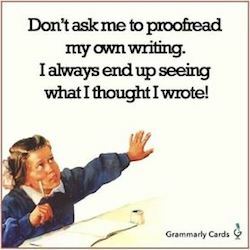 A professional editor advising writers to self-edit? Surely not! So why self-edit at all? Why not hand your manuscript over to the professionals the second you type ‘The end’ and have done with it? Two words – first draft. Do you really want someone else seeing the initial results of your brain going into overdrive while your hands struggled to type the words fast enough? No, neither do I. Furthermore, many editors and proof readers charge per 1,000 words, so if you can rein in the word count it’ll gain you some Brownie points with your bank manager too. Self-editing is very relevant to me at the moment since I spent my Christmas break working through my own novel, Dory’s Avengers, due for re-release later in the year. I did this with the benefit of hindsight, extensive editing experience and the constructive criticisms of a number of reviewers, none of which I had four years ago when I first signed up to publish (with a vanity publisher – big mistake). Back then the manuscript weighed in at a whopping 163,000 words; I’ve since cut out 40,000 words of waffle and over-emphasis, rewritten passages that struggled, and dealt with characters acting out of character (why would someone who’s snivelling and needy in one chapter suddenly become admirably strong willed in the next?) and knowing things they couldn’t possibly know. (Just met someone for the first time? Well naturally you’re going to know all the names of their extended family – not!) Having done all this, though, I will still be employing professionals to go over my work before I publish. Yes, even editors use editors. If you’re not happy with parts of your manuscript, the likelihood is your readers won’t enjoy those parts either. Can they be amended? Do they need to be included at all? Does your prologue (if you have one) entice people to read on or turn out the light and go to sleep? Does your epilogue (if you have one) add anything to the story, or is it just that you can’t let go? (Yep, been there, done that.) I know scrutinising every part of your manuscript will take time, but it’s well worth the effort. Over the coming weeks I will share with authors following my blog the writing tips I’ve compiled from my three years as an editor, but I want to emphasise that these are only tips, not rules. You are the creative talent behind your manuscript and it’s essential that your author voice is heard; I merely make suggestions to help you produce a sublime reading experience. Next week I intend to tackle the ‘show don’t tell’ concept you may have heard writing coaches and other such experts lauding. Many authors ask me about that one, but it’s really not as daunting as it sounds. However, I recognise it’s not enough simply to wag an admonishing finger and say, ‘Ah, you should show your readers, not tell them’. It would be a lot better if I actually – well – showed you! If you’re an author looking for an editor and you’d like more information on the services I offer, please either click on the image below or email me directly on alisoneditor@outlook.com.